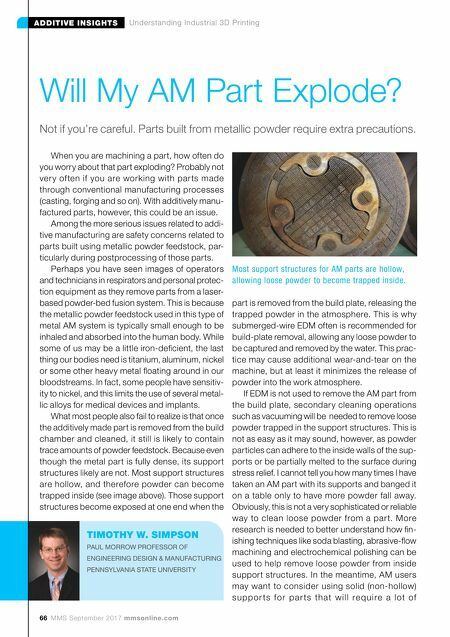 66 MMS September 2017 mmsonline.com ADDITIVE INSIGHTS Understanding Industrial 3D Printing When you are machining a part, how often do you worry about that part exploding? Probably not ver y of ten if you are working with par ts made through conventional manufacturing processes (casting, forging and so on). With additively manu- factured parts, however, this could be an issue. Among the more serious issues related to addi- tive manufacturing are safety concerns related to parts built using metallic powder feedstock, par- ticularly during postprocessing of those parts. 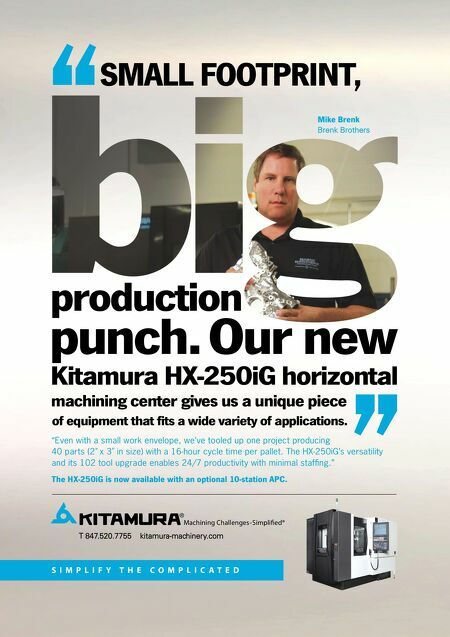 Perhaps you have seen images of operators and technicians in respirators and personal protec- tion equipment as they remove parts from a laser- based powder-bed fusion system. This is because the metallic powder feedstock used in this type of metal AM system is typically small enough to be inhaled and absorbed into the human body. While some of us may be a little iron-deficient, the last thing our bodies need is titanium, aluminum, nickel or some other heavy metal floating around in our bloodstreams. In fact, some people have sensitiv- ity to nickel, and this limits the use of several metal- lic alloys for medical devices and implants. What most people also fail to realize is that once the additively made part is removed from the build chamber and cleaned, it still is likely to contain trace amounts of powder feedstock. Because even though the metal part is fully dense, its support structures likely are not. Most support structures are hollow, and therefore powder can become trapped inside (see image above). Those support structures become exposed at one end when the part is removed from the build plate, releasing the trapped powder in the atmosphere. This is why submerged-wire EDM often is recommended for build-plate removal, allowing any loose powder to be captured and removed by the water. This prac- tice may cause additional wear-and-tear on the machine, but at least it minimizes the release of powder into the work atmosphere. If EDM is not used to remove the AM part from the build plate, secondary cleaning operations such as vacuuming will be needed to remove loose powder trapped in the support structures. This is not as easy as it may sound, however, as powder particles can adhere to the inside walls of the sup- ports or be partially melted to the surface during stress relief. I cannot tell you how many times I have taken an AM part with its supports and banged it on a table only to have more powder fall away. Obviously, this is not a very sophisticated or reliable way to clean loose powder from a par t. More research is needed to better understand how fin- ishing techniques like soda blasting, abrasive-flow machining and electrochemical polishing can be used to help remove loose powder from inside support structures. In the meantime, AM users may want to consider using solid (non-hollow) s u p p o r ts fo r p a r ts th at w i l l re q u i re a l ot of Will My AM Part Explode? Not if you're careful. Parts built from metallic powder require extra precautions. TIMOTHY W. SIMPSON PAUL MORROW PROFESSOR OF ENGINEERING DESIGN & MANUFACTURING PENNSYLVANIA STATE UNIVERSITY Most support structures for AM parts are hollow, allowing loose powder to become trapped inside.